Patricia has been married for many years to her husband John, a bass player she met in the TSO and Osteopathic Physician. She is the mother of two grown sons who also were involved in music through high school. including performing in Carnegie Hall with the Tucson Philharmonia Youth Orchestra. They have both served in the military as officers and are continuing life with successful careers. She also enjoys her dog Winston, her horse Leo, and playing tennis. When did you start playing the harp? I began my harp studies at age 8. 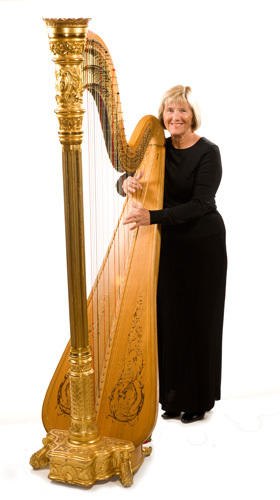 There was a harp in the living room and my mom was a professional harpist. It has a wonderful sound and is beautiful to look at. My grandmother was a concert pianist and her mother was a singer. What is your favorite piece for orchestra? Anything with harp in it. Hobbies? : I play tennis. I take tennis lessons and feel that a teacher is a better teacher if they are also a student. I also ride horses. I enjoy cooking and taking care of my family – a husband and two young men who are in college. Pets:I have a wonderful yellow lab named Saber. He loves to listen to me practice. I also have a horse named Yoda who is 28 years old.